My kumquat supply was dwindling, but I still had more than I could eat. Some, I’m sad to say, even began to go bad. I knew I had to take drastic action to preserve the kumquats so I could continue to enjoy them at my lazy place. That’s where candying comes in. Once you’ve come up with all the possible ways to enjoy your kumquats fresh, its time to candy. There are two ways to do this, and I tried both. They yield wildly different results for entirely different purposes. The first is a glass, which is made by dipping thin slices of kumquat in simple syrup (a mixture of sugar and water) and baking them on a very low temperature for a few hours until the fruit dehydrates slightly and the sugar forms a glassy coating. Kumquat glass is similar in taste and texture to dried, candied fruit you might purchase in bulk, but it’s slightly more elegant in form. The hard, tart-sweet slices make a beautiful garnish for any dessert or cocktail. 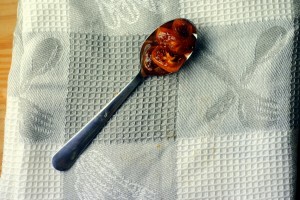 Candied kumquats are prepared by chopping up kumquats and simmering them in simple syrup. 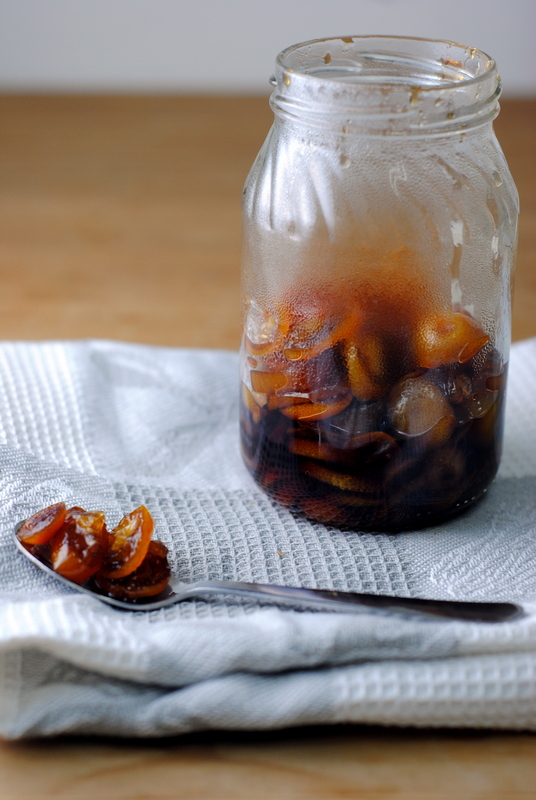 What’s fun about this method is that you end up not only with the candied kumquats but also with kumquat simple syrup because the syrup becomes infused with kumquat flavor, but you don’t need all of it in the jar. I have been enjoying these with my morning breakfast of yogurt and granola but they would also be amazing on ice cream. You can make a Champagne cocktail with them by spooning some into the bottom of a flute and topping with bubbly. You can spoon a little on top of cupcakes. Or put it in a cupcake! Truly, the possibilities are endless. For both of these recipes you can use more or less kumquats, depending on what you have and how much you want. You shouldn’t need to adjust the simple syrup unless you’re making a really big batch. When I made these together I first prepared the simple syrup, then dipped the slices for the glass and used the remaining for the candied kumquat. Preheat the oven to 175F. 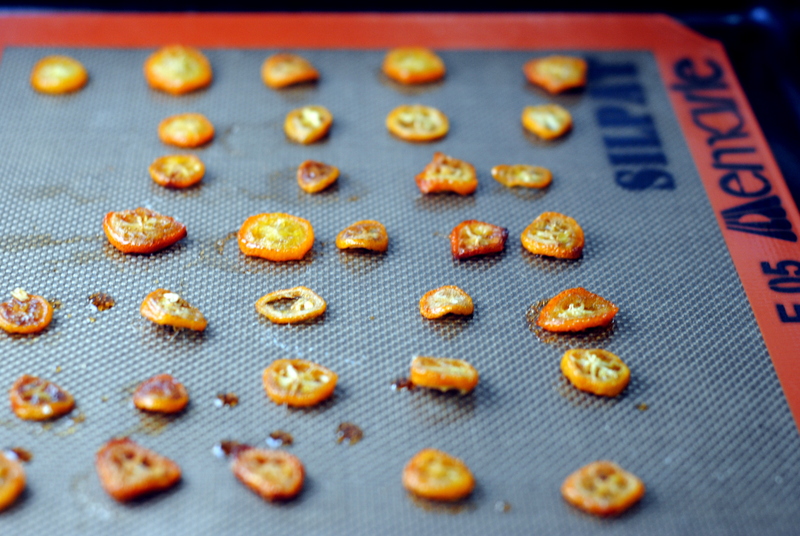 Dip the kumquat slices in the simple syrup and transfer to a Silpat-lined baking sheet. 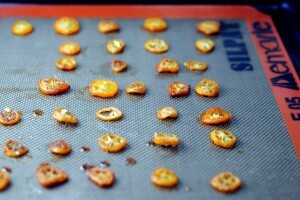 Bake for 1 hour and 20 minutes, or until the kumquat slices are dry but glossy. Flip and bake for another 10 minutes. Remove from the oven and allow to cool. Store in a tightly covered container at room temperature. Put the kumquats and simple syrup in a small pot over medium heat. Bring to a boil then reduce the heat; simmer for 10 minutes, stirring often. The kumquats are done when the syrup is slightly thickened and sticks to the fruit. Using a slotted spoon, transfer the kumquats to a clean glass jar. Spoon a few tablespoons of simple syrup on top. 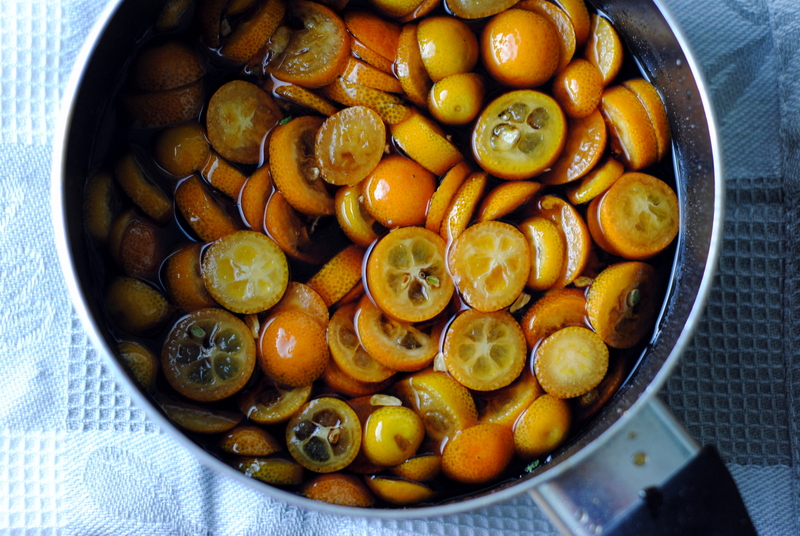 Transfer the remaining simple syrup – which is now kumquat simple syrup – to another glass jar. Allow both to cool before sealing and refrigerating. * To make simple syrup combine 1 part each water and sugar in a pot and simmer until the sugar is dissolved. I’ve always enjoyed the surprise of candied kumquats in both sweet and savory dishes at restaurants. Thanks for inspiring me to try my hand at making my own now. Pingback: “Food Tip” del giorno – Kumquats! | mangia con me! Thanks for this post! Our kumquats usually end up rotting (we have several plants); You can only eat so many right off the tree. Will definitely try to preserve them before letting them rot again! Whole plants, how lucky! This is definitely a great way to make sure they don’t go to waste. Makes a great gift too! The candied kumquats will keep for a few weeks in the fridge, or you can properly can them to ensure they last even longer. Hope you enjoy! Thanx for popping over and dropping a line at my blog. I have a beautiful and bountiful tree in my kitchen which has yielded over 200 kumquats this year. I am making glass today with the remains of our fruit feast. Thanks so much for the recipe! Oh wow! Sounds amazing. I have a big basket in my fridge that I need to put to good use as well. Enjoy!! store it in battery cells somewhere inside the home. the expansion of China, still it will not equal the amount of coal that people use. are able to make a sizable contribution in your household’s electricity requirements.